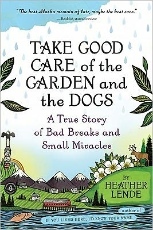 After a near-fatal bicycle accident in her tiny Alaskan town, bestselling author Heather Lende has an opportunity to contemplate faith and friendship, observe the breathtaking beauty of the northern wilderness anew, and truly come to appreciate the remarkable inhabitants of Haines, Alaska, without whom she could never have recovered. Lende's idea of spirituality is rooted in community, and her irrepressible spirit and commitment to living life on the edge of the world deepens our understanding of what links us all. Like her own mother's last instructions, ''Take good care of the garden and the dogs," Lende's writing, so honest and unadorned, offers profound lessons to live by. Here she reminds us (courtesy of Ralph Waldo Emerson) that "the proper response to the world is applause."